During the contentious campaign to decide the fate of Mission Valley last fall, SDSU and its boosters repeatedly promised to pay “fair market value” for the old Qualcomm Stadium site. Now, a top school official says the city should reduce the sales price by millions of dollars. This post initially appeared in the April 10 Morning Report. Get the Morning Report delivered to your inbox. A top official from San Diego State University said Tuesday that the city should reduce the sales price for the old Qualcomm Stadium by millions of dollars. 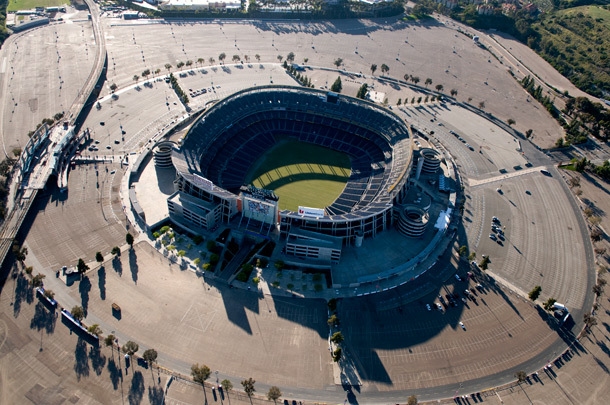 During the contentious campaign to decide the fate of Mission Valley last fall, SDSU and its boosters repeatedly promised to pay “fair market value” for the old Qualcomm Stadium site. The university wants to construct a new stadium there, create a river park and build more research space and housing. University officials and boosters have always danced a fine line around a ballot measure voters approved that includes a Catch-22 of legalese. The measure says the city should not pay to demolish the stadium. But the measure also says that the city may give the university a discount for demolishing the stadium, which is essentially a backdoor way of making the city pay to demolish the stadium. The university’s vice president for financial affairs, Tom McCarron, told the City Council on Tuesday that the university wanted that discount. The university and the city are negotiating the terms of a deal they both hope to reach by early 2020. A 2017 estimate says a stadium demolition could cost about $11.5 million. Estimates of the value of the Mission Valley site have varied widely, from over $200 million to $83 million to $74 million. McCarron also said the university may want the city to pay for part of the river park SDSU promised to build. Money for the park isn’t supposed to come from the city’s general fund but the city has other funds that could be tapped to pay for the park’s construction or maintenance. SDSU has been unclear about how it will finance its Mission Valley expansion.